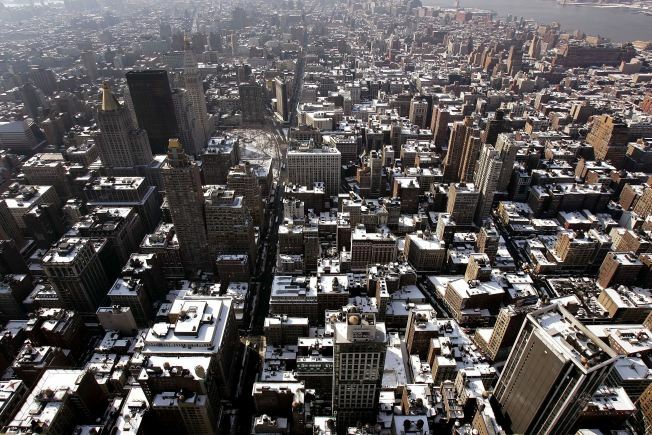 The snowy rooftops of Manhattan can be viewed by webcam. Whether you're indoors by force or choice on Monday, New York City offers a number of webcams making it easy to enjoy the snow without the cold or wind. The Central Park webcam offers a view from up high. Standard Hotel webcam in the Meatpacking District (which currently needs a cleaning,) offers a great scene of the Hudson River as well as the progress on the future High Line park. You can see the partly shoveled snow on the walkway of the Brooklyn Bridge from City Hall. Ground Zero looks especially peaceful covered with snow. Wired New York's Midtown cam shows plenty of rooftops covered in white, and also offers a great view fairly empty streets. The Intrepid Sea Air & Space Museum offers two views: a pretend view of a sunny day, and one live view of the historic aircraft covered in snow on the deck of the aircraft carrier. The Times Square webcams are actually a bit disappointing considering the snow's been plowed rather effectively there already. Last but not least, the city's traffic cameras offer some great glimpses of dozens of streets around all five boroughs. See NewYorkology for more New York webcams.